Konnichi-wa from a partly cloudy but very pleasant day at the Okayama International Circuit. 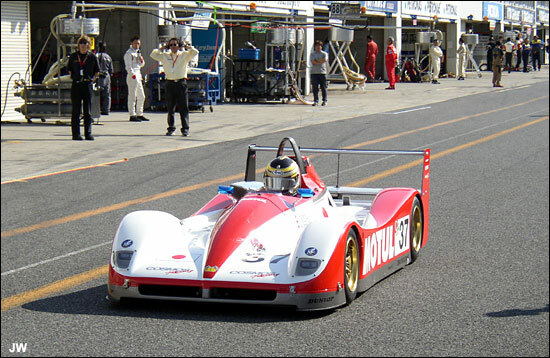 This is the first day of the final round of the 2006 Japan Le Mans Challenge. It has been a mixed introduction for this, the third of the global Le Mans type series efforts. The glass half-full perspective holds that it is difficult to round up an adequate number of ACO-legal cars to hold a proper championship and that this pilot effort should be taken as an enthusiastic introduction rather than as a final statement. The glass half-empty approach states that the potential is not there. It’s probably too early to judge. It is definitely a fuller plate this weekend with 20 entries, eclipsing the first two races where the organizers were barely able to scrape together a starting field into the two-digit range. Alas, none of the additional cars, apart from a GT2 Porsche, would be eligible to run at Le Mans in 2007. Indeed, that is what the JLMC faces, the prospect of handing the four class crowns to teams and cars unable to present proper invitations to the party next June. We do have the prospects of good racing here. 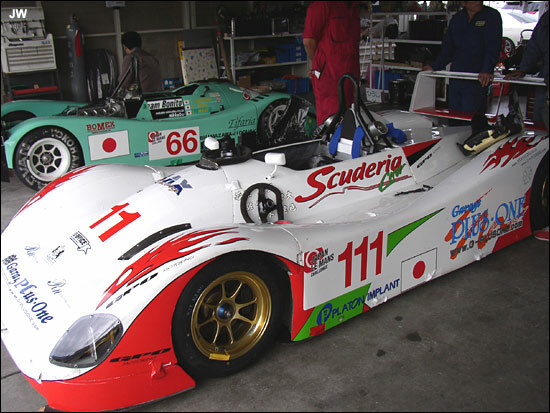 P1 is headed by the Hitotsuyama Zytek which has run fast, but retired, at both previous races. The Mugen-entered “works” Courage-Mugen also hit problems at its only previous appearance at Motegi. 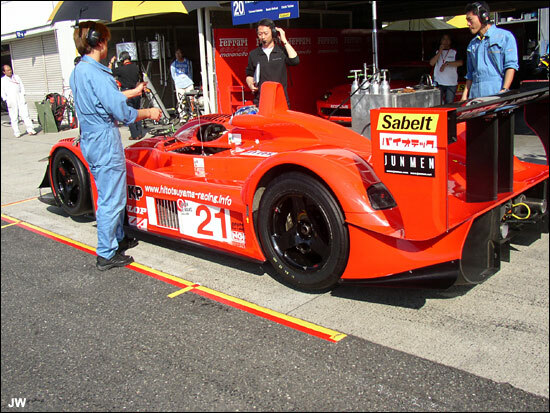 The remainder of the P1 and all of P2 is composed of center-seat single-seat sports cars that have been a staple of mid-level Japanese prototype racing for some time. They and the other non-ACO ready cars have been given a dispensation to help pad the field. 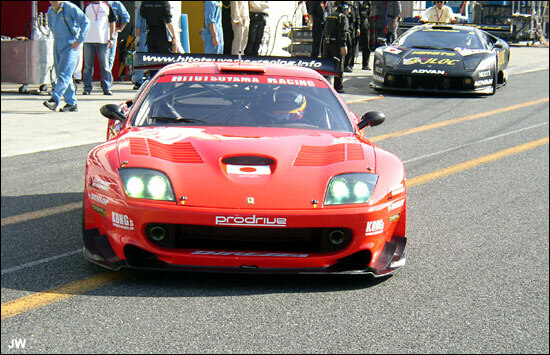 Hitotsuyama’s other entry, a 550 Maranello, has won both rounds overall from the GT1 class. It faces the Le Mans veteran JLOC Murcielago this time and a Mosler from the Super GT series. As elsewhere, GT2 is the largest category, with three full Porsche 996s plus an older 964. The Team Kawamura RSR has won both races thus far. There are also two Mazdas in the class. One of them, No. 7, is woman-owned, operated and driven. The drivers have to hand over a ticket before leaving pit-lane. 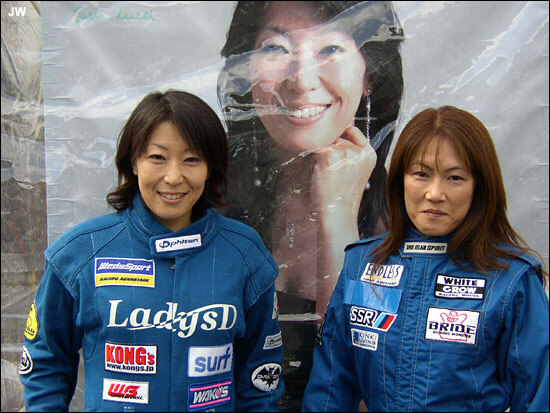 Naoko Hagiwara and Sakiko Tsuji, above. The 3.7-kilometer Okayama circuit, formerly known as TI Aida, features a set of sweeping turns past some of the many verdant small peaks dotting the area, then back along a long straight, some sharp bends behind the paddock and then a hairpin and double right-angle combination returning to the finishing straight. One of the most dramatic sections is the broad hairpin before the long straight. It is set at the base of a rocky cliff, somewhat reminiscent of the old Rouen circuit. The surface is quite narrow in most sections, that is, just about anywhere apart from the front stretch. The track is within Okayama Prefecture, located about 50 kms. northeast of the city itself. Okayama is in the western portion of the main Japanese island, Honshu, and is about one-third of the distance between the major Osaka-Kobe metropolitan area and Hiroshima on the west coast of the island. As noted, we are in the midst of a very pleasant autumn weekend. Temperatures should be in the low 20s. A quick and very silly cultural note—better ones to follow. Those familiar with this otherwise beautiful country know that there are easily more vending machines in Japan then there are people in Sweden. That’s probably not an exaggeration. They are simply everywhere. On the drive up from the train station we passed through a cluster of three houses nestled at the base of a hill above a delightful stream. Crouched between two of the houses was the ubiquitous vending machine dispensing bottles of Pocari Sweat to any would be angler or hiker who stumbled by with the yen. On a more physical note, it always impressive how hilly is this land. The few flat spots are the locations of the cities. With 30 minutes gone of the first of two 90-minute free sessions, 18 of the 20 cars have taken to the track. Only the No. 111 Oscar and the No. 8 Mazda RX-8 have yet to be seen. The gaps in the field are already too evident. The Zytek leads with a 1:22.251 followed by the #16 Courage Mugen at 1:23.267. Shinsuke Yamazaki leads P2 with the No. 18 GC-21 (Grand Champion 21) at 1:30.450. The tightness of that class is indicated by the No. 15 Oscar’s 1:30.946 behind him. This car is actually brand-new for this race. It uses a Honda S2000 motor as opposed to the Toyotas and Mazdas found in the other Japanese sports-racers. The No. 15 Oscar is an aluminum monocoque, somewhat retrograde from the earlier carbon-fiber versions. The No. 20 Ferrari is well clear of the Lamborghini with a 1:31.407 and the Kawamura Porsche is figuratively all alone in GT2 at 1:35.222. Same format, with 1000-kilometer events and with the non-ACO cars accepted again. Throughout the first session the relative orders remained but times crept downward. The Zytek has improved to 1:21.887, the No. 18 GC to 1:30.116, and the Ferrari to 1:32.764. The No. 8 Mazda joined the field late and struggled to get anywhere near the two-minute mark after numerous laps out there. It’s been having differential problems. It finally manages a blinding 1:56 before sputtering down to 2:41—oh, dear. The No. 111 Mazda powered P1 car did not take to the track during the first session but Team Myst did have another car out there briefly, a spare Oscar-Toyota. 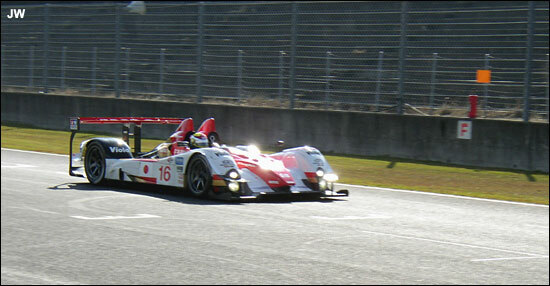 The session ends with the continued mild improvements of some cars. P2 has tightened considerably with No. 15 at 1:30.101. The Courage is also a bit quicker but still well behind the Zytek. The No. 27 Porsche also remains the clear leader in GT2 while the GT1 leading Ferrari appears to have stopped out on the course. The Courage set the pace in the early part of the much warmer afternoon session, turning a 1:22.42 compared to the Zytek’s 1:23.3. The Le Mans veteran Lambo ran third fastest overall for the first half-hour. At 1:31.6 it was ahead of a struggling Ferrari at 1:34.1. The P2 cars seem not to have gotten up to speed yet. The little purple P2 Oscar nominated T-car went out and off at the hairpin at the bottom of the long downhill straight. The session was interrupted while it was dug out of the kitty litter. On the restart the Zytek takes its ‘rightful’ spot on top with a 1:21.745. None of the P2 cars have yet to improve upon the Lamborghini’s time for 3rd overall. The No. 111 Oscar that did not run this a.m. is going quite well at 1:33.0. The beleaguered No. 8 Mazda has not run in the afternoon. Yamazaki again ran quickly in the No. 18 GC-21 at 1:32.192, but only good enough for fourth overall. With only two races held in the three race series, the points situation is obviously in flux, with nearly all the regulars—however few there are, with a shot at the respective titles. The near complete meltdown of the P1 cars leaves the lead driver of the No. 66 Oscar, Takahiko Shimazawa in the lead. P2 features a six-way draw between the drivers of the converted F3 cars, GC No. 4 and GC No. 18. Given the two outright wins, the trio in No. 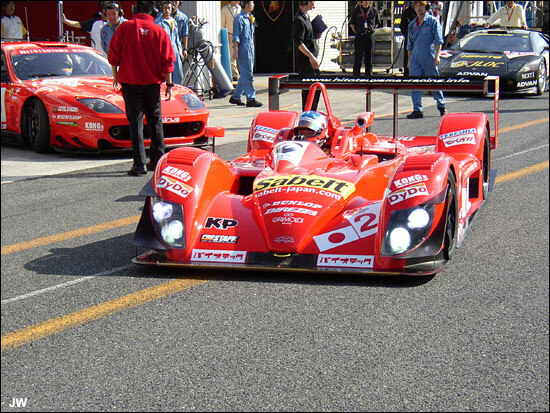 20, Ferrari drivers Kataoka, Hattori, and Tajima hold the lead for the class. However, the Mosler has done well and its trio is only 2 points back. 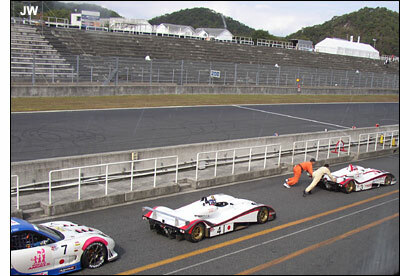 The identical situation holds in GT2 with Aoyama, Ohtsuka, and Nishida in front with the No. 27 team. Their rivals in Porsche No. 5 have a clear shot at them, although Team Takamizawa’ third driver, Oyaji did not score previously. On the Teams’ side, Myst has thus far been the only one to score in P1. Aim (No. 18) and MYZ (cars 3 and 4) are tied for the P2 lead. Hitotsuyama’s Ferrari team is only 2 points clear of the Leyjun Mosler, and once again the same holds true with the top G2 teams. It takes until nearly the end of the session before a P2 car takes the third overall spot. But it’s the new No. 15 rather than the older GC-21 car. As it is the quickest of that marque, I guess we can refer to it as the Oscar winner. The Honda-engined car ends the day at 1:29.6. The GT2 leading Porsche also improved slightly to 1:35.3. A clump of Oscars ended up in the 1:37s, headed by this one. Qualifying will be held tomorrow, Saturday, with two sessions. The 60-minute morning period is the so-called “Drivers’ Qualifying” session and the times from the afternoon are then taken to set the grid. It consists of two 20-minute sections, one each for the two Prototype and GT classes. 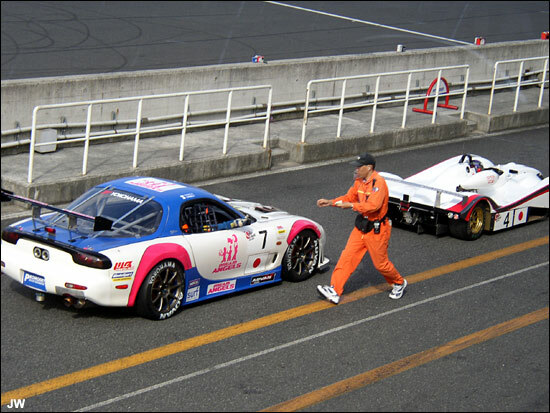 Support races included the CERJ, aka Patrick Peter’s historic car sideshow, and a Mazda GT race. The race will be the usual 1000-kilometers (271 laps) or 6 Hours, whichever comes first. This being a tight circuit, expect the latter. The start is at 11:00 and sunset is at 17:11, so the last half-hour or so should be spent in the shadows cast by the many pretty hills.